Equilibrium is an important concept that permeates many disciplines. In chemistry we think about the point where the rate of forward reaction is equal to the rate of backward reaction. In economics we think of the point where supply equals demand. In physics we can see how gravity is balanced by forward velocity to create things like planetary orbits. No matter which discipline we are examining, the core idea remains the same: Equilibrium is a state where opposing forces are balanced. In biology, equilibrium is so important that it can mean the difference between life or death; for a species, it can decide whether they will thrive or become extinct. In The Song of the Dodo, David Quammen dives into how equilibrium affects a species’ ability to survive, and how it impacts our ability to save animals on the brink of extinction. Historically, the concept of island equilibrium was studied with a focus on the interplay between evolution (as the additive) and extinction (as the subtractive). It was believed that speciation, the process where one species becomes two or more species, caused any increase in the number of inhabitants on an island. In this view, the insularity of islands created a remoteness that could only be overcome by the long processes of evolution. However, Robert MacArthur and E.O. Wilson, the co-authors of the influential Theory of Island Biogeography, realized that habitats would show a tendency towards equilibrium much sooner than could be accounted for by speciation. They argued the ongoing processes that most influenced this balance were immigration and extinction. The type of extinctions we’re referring to in this case are local extinctions, specific to the island in question. A species can go extinct on a particular island and yet be thriving elsewhere; it depends on local conditions. As for immigration, it’s just what you’d expect: The movement of species from one place to another. Island immigration describes the many ingenious ways in which plants, animals, and insects travel to islands. For instance, not only will insects hitch rides on birds and debris (man made or natural, think garbage and sticks/uprooted seaweed), animals will do the same if the debris is massive enough. Seeds, meanwhile, make the trip in the feces of birds, which helps to introduce new plant species to the island, while highly motivated swimmers (escapees of natural disasters/predators/famine) and hitchhikers on human ships (think rats) make it over in their own unusual ways. 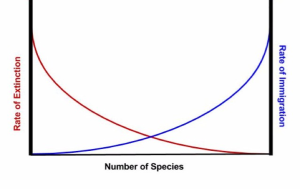 The decrease in immigration rate and the increase in extinction rate are graphed not against elapsed time but against the number of species present on a given island. As an island fills up with species, immigration declines and extinction increases, until they offset each other at an equilibrium level. At that level, the rate of continuing immigration is just canceled by the rate of continuing extinction, and there is no net gain or loss of species. The phenomenon of offsetting increase and decrease – the change of identities on the roster of species – is known as turnover. One species of butterfly arrives, another species of butterfly dies out, and in the aftermath the island has the same number of butterfly species as before. Equilibrium with turnover. 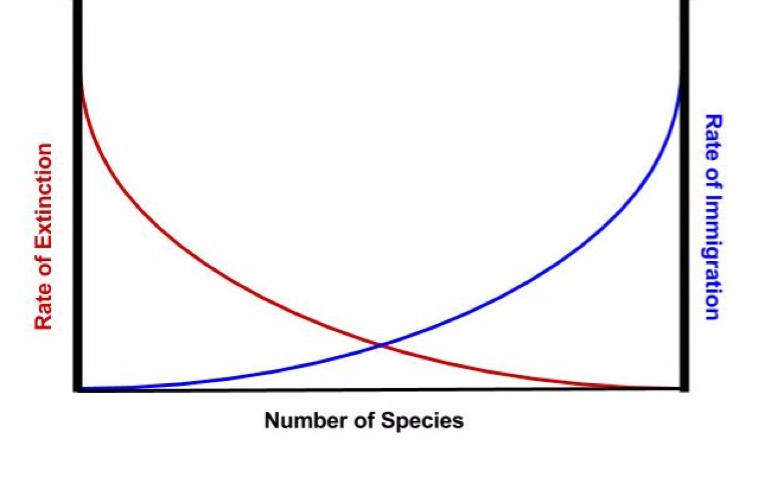 So while the specific species inhabiting the island will change over time, the numbers will tend to roll towards a balanced point where the two curves intersect. Of course, not all equilibrium graphs will look the like one above. Indeed, MacArthur and Wilson hoped this theory would be used not just to explain equilibriums, but to also help predict potential issues. When either curve is especially steep – reflecting the fact that immigration decreases especially sharply or extinction increases especially sharply – their crossing point shifts leftward, toward zero. The shift means that, at equilibrium, in this particular set of circumstances, there will be relatively few resident species. In other words, high extinction and low immigration yield an impoverished ecosystem. To you and me it’s a dot in Cartesian space, but to an island it represents destiny. There are two key ideas that can help us understand the equilibrium point on a given island. First, the concept of species-area relationship: We see a larger number of a given species on larger islands and a smaller number of a given species on smaller islands. Second, the concept of species quantity on remote islands: Immigration is much more difficult the further away an island is from either a mainland or a cluster of other islands, meaning that fewer species will make it there. In other words, size and remoteness are directly correlated to the fragility of any given species inhabiting an island. Equilibrium, immigration, evolution, extinction – these are all ideas that bleed into so many more areas than biogeography. What happens to groups when they are isolated? Jared Diamond had some interesting thoughts on that. What happens to products or businesses which don’t keep up with co-evolution? They go extinct due to the Red Queen Effect. What happens to our mind and body when we feel off balance? Our life is impoverished. Reading a book like The Song of the Dodo helps us to better understand these key concepts which, in turn, helps us more fundamentally understand the world.